Now, I’m sure that these formulations are probably quite different, and the more expensive ones could very well be amazing. But for someone just looking to try out peptides for the first time, DECIEM’s price point is incredibly tempting. So, what’s the deal with peptides, anyway? Peptides are basically very small proteins. In chemistry, a chain of amino acids is a peptide if it’s short (consisting of 50 amino acids or fewer), and a protein if it’s longer. A polypeptide is a chain of peptides, and proteins can be defined as a chain of polypeptides. In biology, peptides are of great interest because they, like proteins, are hugely diverse and are the building blocks of the body. With respect to skincare, research suggests that peptides can provide several ways of improving the texture of skin. For example, certain peptides can trigger living skin cells into creating more collagen, which keeps skin looking firmer and younger. Matrixyl (palmitoyl pentapeptide) is one of the most popular “signal” peptides in the skincare industry. Another use is as a delivery mechanism, because peptides are small enough to pass into the skin. (The outer layer of your skin is dead cells, and a product that can’t penetrate this layer won’t be able to affect the living cells below.) Something like copper, which has been shown to help heal and repair skin, can be attached to a peptide and be applied topically. Neuropeptides are another type, which behave a bit like Botox, and are intended to block neurotransmitters to facial muscles. Argireline is a popular one. Whether or not peptides work well applied to the skin will also depend on the product itself: will the peptides break down in a particular formula and become useless? Or does the product allow the peptides to be absorbed by the skin? 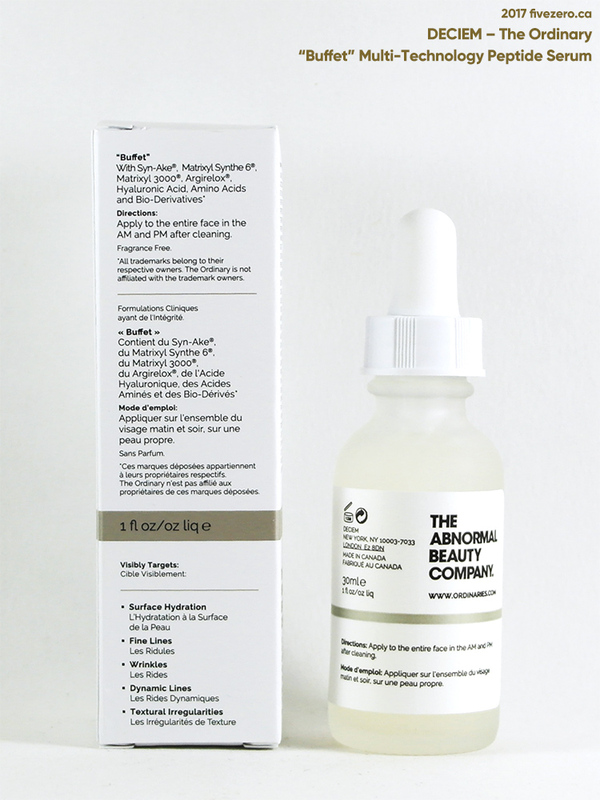 How does the peptide product interact with other skincare products being used? And, of course, can peptides really do anything at all to the skin, even when properly absorbed? DECIEM usually address these kinds of delivery issues in their product descriptions, but not for “Buffet”. 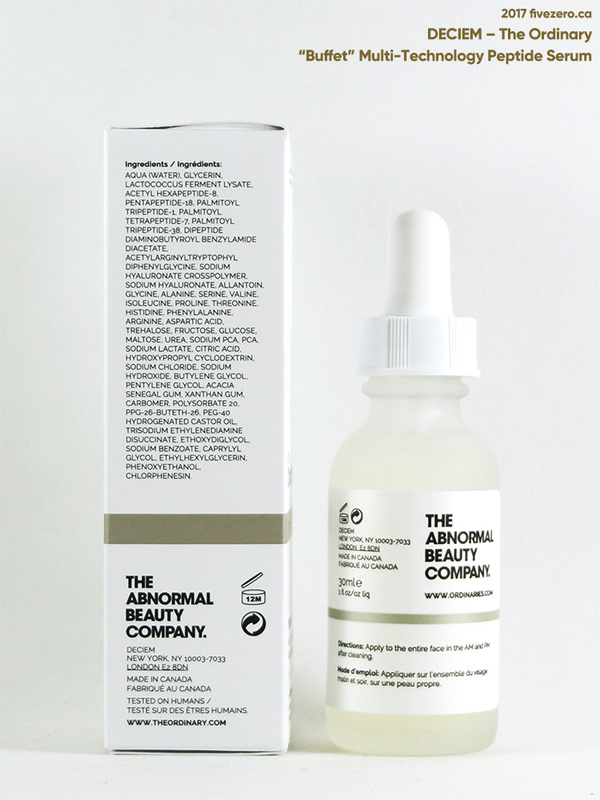 They actually make a few different peptide formulas under their The Ordinary (“Buffet”, Matrixyl 10% + HA), Hylamide (SubQ Anti-Age), and NIOD (Copper Amino Isolate Serum) brands. I’ll just cover The Ordinary “Buffet” here, since that’s what I’m reviewing today. It is free from alcohol, silicones, nuts, and gluten. It does contain oil. Since “Buffet” is the only peptide product I’ve ever tried, I obviously won’t be able to compare it with others on the market. In my review, I just talk about how my skin responded to it, and whether or not I’m interested in trying any other peptide products in the future. I started using “Buffet” back in April, and I used it for about two months straight before I had to abruptly stop for reasons unrelated to its performance. My skin type is dry and dehydrated, and it has a tendency to become a bit oily near the end of the day if I’m dehydrated, or if the air is just very dry. I’m in my late 30s, and while wrinkles aren’t really an issue right now, they’re definitely something I’d like to keep at bay for as long as possible. I’m slightly acne-prone, as well, though I find that I get acne more from hormones and from poor lifestyle choices (when I don’t sleep enough, get stressed, or indulge in junky food). I don’t often get acne from products, with the exception of chemical sunscreens. So, during this time, I had changed up my routine a bit. I had started to use a cleansing oil in the evenings (The Face Shop Rice Water Bright Light Cleansing Oil) because I wanted to ensure that I was removing all of my daily sunscreen (Shiseido Ultra Sun Protection Cream SPF 50 for Face). Sometimes I’d do a second cleanse with philosophy Purity, or some random cleanser sample I’d have around. I’d moisturize with Valcena Nutri-Lift Serum, which is really more like a light moisturizer than a serum, in the morning, and Valcena Multi Active Régénérante Night Cream in the evening. And, because I was a little over excited about hauling from The Ordinary, I also worked the Hyaluronic Acid 2% + B5 and 100% Plant-Derived Squalane into my routine very quickly. I applied the “Buffet” right after cleansing, so that the product was closer to the skin and was more likely to penetrate it. I preferred the hyaluronic acid to be sandwiched between two watery products, since the hyaluronic acid molecule can bind something like 1,000 times its own weight in water. The worry is that it can draw water away from the skin if there isn’t enough available on the surface; I have no idea if this is legit but I’m guessing it couldn’t hurt to be careful. As you can see, this is a fair amount of product layering for someone who normally only uses a cleanser and a moisturizer, and occasionally a facial oil! “Buffet” has a very light, gel-like texture. It’s clear, and smooths onto the skin well. The apothecary-style glass bottle and dropper are perfect for application. I use about 2–3 drops for my face and upper neck. The product dries quite quickly and leaves a slightly sticky feeling, though I apply other products over this, so that doesn’t bother me in the least. But my cheeks were no longer dry flaky. It went away, just like that, practically overnight. I struggled with flaky cheeks all winter, and boom, it was gone. Within perhaps a week, I started to notice that my skin was getting super plump in the mornings. Smooth and plump! But was it just retaining water, or something? I have pretty chubby cheeks normally, so it was a little hard to tell, ha! I suspected the plumping was down to the hyaluronic acid, but when I did a little testing (by switching over to some other skincare products for about a month), it seemed that “Buffet” was actually responsible for much of the plumping. Applying hyaluronic acid with “Buffet” definitely seemed to enhance the plump factor, though. I really liked the smoothing effect, as it also made my pores seem smaller. Maybe not so much the plumping effect, but to each her own. I have chipmunk cheeks, as it is! (And when I say plumping, my skin just felt a bit water-heavier, not like I developed mumps or anything.) Applying an occlusive overnight, like the squalane or some other facial oil, increased the plumping, too. But all was not well! After about two months, I started to really break out. Normally I would think it was just down to lack of sleep (which wreaks havoc on my skin), but I was also breaking out where I didn’t normally break out. Hormonal acne and stress acne manifests itself as cystic acne on my chin and my jawline, for the most part, and sometimes up along the cheek. But what I was also getting was small, non-cystic zits around my nose and cheek areas. I immediately cut out everything new (including foundations I was testing). I went back to my regular oil cleanser/moisturizer routine, but nothing weas really helping. I did switch my water-resistant Shiseido sunscreen to a less tenacious formula, Innisfree Perfect UV Protection Cream Triple Care. This seemed to help, but not entirely. Finally, I cut out the cleansing oil, and things started to calm down. I don’t know for sure yet whether The Face Shop cleansing oil was the culprit, but let’s just say I haven’t gone back to it! The ridiculous thing is that I’d used up a great deal of it up to this point, but because I only used it occasionally before this spring, it may not have been able to break me out until I started using it every day. Of course, I am also still using sunscreen through the summer, so my sunscreen may still be causing problems—I just can’t really go without it, though. I definitely noticed that the smoothing, plumping effect of these products go away if you do not use them consistently, so I don’t feel they are actually improving my skin. They just seem to give a nice cosmetic boost. I’m definitely interested in trying more peptide serums, just to see how they compare. I’ll be finishing up my bottle of “Buffet” quite soon, and have DECIEM Hylamide SubQ Anti-Age waiting! 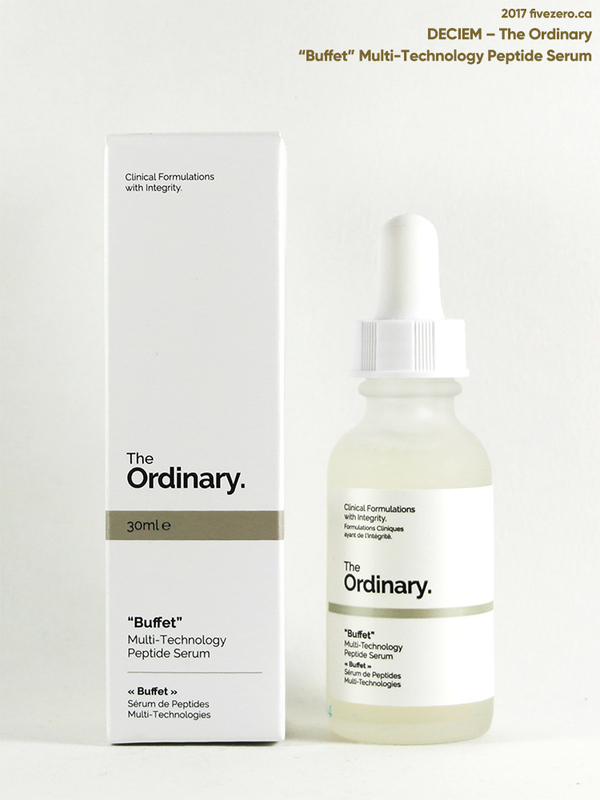 DECIEM The Ordinary “Buffet” Multi-Technology Peptide Serum contains 30 mL and retails for CA$14.80. The formula is free of alcohol, silicone, nuts, and gluten. The company is cruelty-free* and vegan. Ahh, I have heard that hyaluronic acid is a tricky one because there are different molecule sizes. So some products will work better for an individual than others! I’ve been seeing stuff about the ordinary all over online. Everyone seems to love it. Don’t they have a foundation as well? I am missing this Serum so much – I will be ordering a replacement as soon as I return from vacation later this week! That’s quite the skincare routine you’ve got there! 😀 Funny you mention The Face Shop cleansing oil – I just started using one from them (Pore Clean version with the blue bottle) and I feel like it leaves a film on my skin. I’m also breaking out on my chin quite badly although it could be due to hormones / stress. Who knows! I haven’t switched out any other skincare. The Buffet is on my list of items to pick up from The Ordinary… it should be a good (inexpensive) replacement for the Estee Lauder Advanced Night Repair. Argh yes, I just had a bout of hormonal acne, worse than usual. 😭 I don’t think it was anything I was doing/using but it can be so hard to tell sometimes. I hope the Buffet works well for you! It’s always nice to find an inexpensive option for something rather pricy.